Annual contest for the Halloween season offers affiliate partner companies of BuyCostumes.com cash and prizes. "Through BuyCostumes.com, we strive to offer the largest selection of Halloween costumes and accessories for all ages", commented Kristen Grace, Affiliate Marketing Manager. 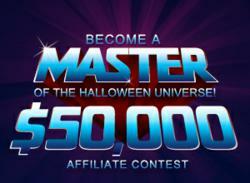 BuyCostumes.com is pleased to announce the 2011 Annual Halloween Affiliate Contest, which allows their affiliate partners to become a “Master of the Halloween Universe.” This contest offers affiliate companies the chance to win over $50,000 in cash and prizes. “Our goal is to have fun as we watch our program grow and succeed”, said Priest Willis, Affiliate Manager for BuyCostumes.com. In its eighth year, the contest helps to engage and motivate the company’s affiliate partners during the company’s busy Halloween season. During September and October, the company estimates that they will ship over 60,000 packages per day to consumers nationwide and internationally from their world-class distribution center and corporate headquarters in New Berlin, Wisconsin. Affiliates of the BuyCostumes.com program are rewarded based on the sales they generate during the contest, which runs from September 1st to October 31st. To enter this contest, an affiliate must be a registered partner through the Commission Junction network. For every dollar in sales, affiliates can trade in their grand totals for several different prizes including an iPad2, Wii Fit, Kindle DX 3G, Amazon Gift Cards, and cash prizes of $500 or more. To learn more about the BuyCostumes.com affiliate program, please visit http://www.buycostumes.com and click on "Affiliate Program". Founded in 1999, BuySeasons, Inc. is the leading online retailer of costumes, accessories, party décor and supplies for year-round celebrations and entertaining. BuySeasons, Inc. owns and operates BuyCostumes.com and the Celebrate Express family of websites; BirthdayExpress.com, 1stWishes.com, and CostumeExpress.com, which offers one of the largest assortments of kid’s costumes and birthday party supplies at any single online location. In addition, BuySeasons, Inc. operates a private-label drop ship program for other internet retail partners. BuySeasons, Inc. is a wholly owned subsidiary of Liberty Media Corporation.